This is the result of many design iterations. She went through hundreds of different age/shape/colouring variations. I suspect she may continue to evolve, but i’m happy with her look, at least for the moment and the underlying animation system seems pretty robust. She needs to be able to switch from looking young to old and also be able to pull of pretty and ugly so it’s been quite a challenge to say the least! The next stage is to do some animation performance test to see how well she can pull off some of these characteristics (not to mention to see if i have the chops to nail her performance for the animation reference; Or whether its time to seek out a proper actor / actress for the task!) . So I’ve started doing some matte painting tests to develop a look and feel for the film. At the moment I’m focusing on The Red String section , trying to create a distinct atmosphere for Stina’s trip down into to the underworld. I want it to evoke the old 50s Technicolor film look, particularly with Jules Verne “journey to the centre of the earth” in mind: massive in scale but with a painterly and surreal quality to it. I’ve been testing out projecting matte paintings onto 3d geometry in 3dsMax, then moving the camera around to see how much movement and parallax i can get away with before the illusion is broken. The idea is to keep control of the backgrounds by painting them and only having to use 3d CG to light the characters and specific elements like water. I’ve posted a vid on the main page if you want to see the results. It seems to be working pretty well i think, the main problem seems to be that the images need to be massively detailed to stand up to zooming in. I’m planning to do the film at 1080p HD resolution so my paintings will need to be a least twice that detail i think. 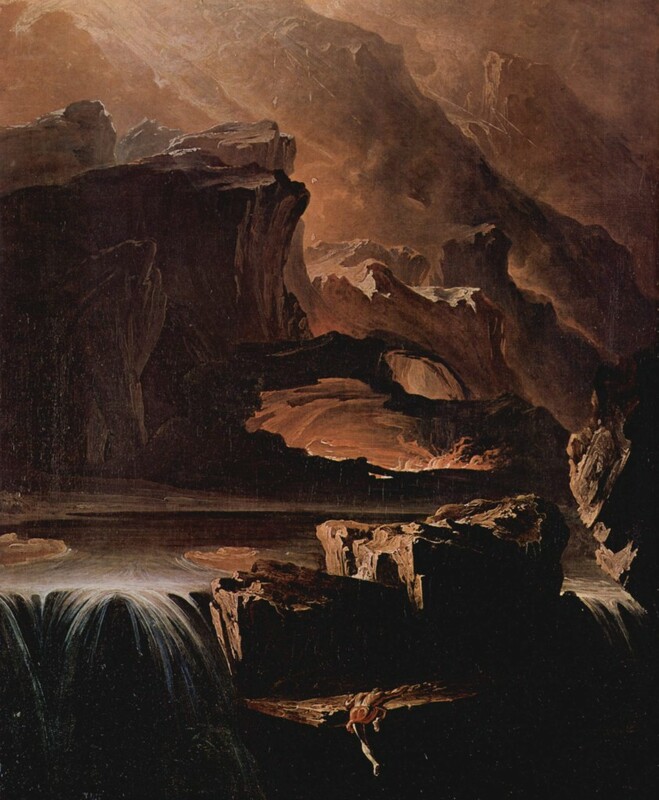 I should also mention the paintings are heavily influenced by (and maybe a little borrowed in places from a painting I saw as a child by John Martin (19 July 1789 – 17 February, 1854) who was an important and influential English Romantic painter of the nineteenth century. So I’ve finished the first complete draft of Stina and the Wolf. It’s been an obsessive month of late nights and neck ache but all very enjoyable. I shall be tidying bits up and tweaking stuff (mostly transition sections) as it still sketchy in places but the ideas are all in place now. I’ll also be getting it ripped apart by some classical type persons to get some much needed perspective. Now i have to pass it over to someone who really knows what they are doing with classical orchestration, to see how many liberties i’ve taken with instrument ranges and breath control! Oh and i need to work out the score.. I suspect that won’t be as much fun as writing the music. Each Act uses specific instruments (orchestration) and melodies (leitmotif) to represent the characters and ideas, with the instruments combining and the melodies evolving as the story unfolds. Stina and the Wolf is a project to turn a short story into a fully animated 25 minute film. At present i’m composing the music. It’s spilt into 5 movements (i’ve completed 4 so far) , each one based on the 5 acts in the story. Each piece is a narrative and attempts to combine orchestration and leitmotif to tell Stina’s story. At present these pieces are sketched out on computer but hopefully (if i can organise funding) i plan to record them with a full orchestra. Being entirely untrained and having not the foggiest clue how to read music, I shall be working with a friend to help me through the final scoring and orchestration. As for the animation itself. I am exploring lots of options at the moment. From full stop motion to painted and CG. I lecture in animation, so have an advantage. But i’m also very keen to involve other people in the process and am presently looking for talented artists to bring their own ideas to the project and help me visualise this world.